This Lease ("Lease") dated as of ______ is entered into between ______ ("Landlord") and ______ ("Tenant"). 1. Premises. Landlord leases to Tenant and Tenant leases from Landlord ______ ("Premises"), as specifically designated on the building layout map, attached as Exhibit A, and incorporated by reference. 2. Term. 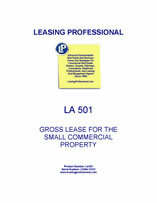 The term of this Lease is for ______ ("Term"), commencing on ______ and ending on ______. 3. Rental Terms and Security Deposit. (a) The rent shall be ______ Dollars ($______) ("Rent") per month, payable in advance to Landlord, on or before the first of the month at the address of Landlord stated in this Lease or at another location Landlord may designate. (b) Upon execution of this Lease, Tenant shall pay to Landlord ______ Dollars ($______), representing the first and last months' rent and a security deposit of ______ Dollars ($______). (c) Upon the default by Tenant under this Lease, Landlord may apply the security deposit to satisfy Tenant's obligations under this Lease, provided that this application shall not cure the default. Immediately following the receipt of notice of this application from Landlord, Tenant shall pay to Landlord an amount equal to that applied by Landlord. Landlord agrees that at the end of the Term Landlord will refund any portion not applied. 4. Use. The Premises may be used and occupied only for _______________, and for no other purpose or purposes without Landlord's prior written consent. Tenant shall promptly comply with all laws, judicial decisions, ordinances, orders and regulations affecting the Premises, their cleanliness, safety, occupation and use. Tenant shall not do or permit any act to be done that will increase the existing rate or cause cancellation of insurance on the Premises or will cause a substantial increase in utility services normally supplied to the Premises. Tenant shall comply with all statutes, ordinances, regulations, and other requirements of all governmental entities that pertain to the occupancy or use of the Premises, and with all rules and regulations that are adopted by Landlord for the safety, care, and cleanliness of the Premises and the preservation of good order on the Premises. These rules and regulations are expressly made a part of this Lease. 5. Alterations. Landlord and Tenant agree that the alterations described on attached Exhibit B, incorporated by reference, shall be completed prior to the commencement of the Term at the expense of the party designated on Exhibit B. Except as described in Exhibit B, any alteration to the Premises without the prior written consent of Landlord shall be a breach of this Lease and, at the option of Landlord, shall cause a termination of this Lease. 6. Possession. Any delay in delivery of possession to the Tenant shall postpone the commencement of rent accordingly, but shall not otherwise affect this Lease. 7. Insurance. Tenant shall pay for and maintain insurance throughout the life of this Lease with general liability coverage of ______ Dollars ($______) minimum coverage per occurrence and all risk glass coverage for full cash value. Tenant will furnish Landlord with proof of insurance issued by an insurer approved by Landlord showing the coverage to be in force and showing Landlord as a named insured for all periods of the Term. Landlord and Tenant each waive the rights of subrogation that may arise against the other because of any act covered by insurance. (a) Any failure by Tenant to pay the rental or to make any other payment required to be made by Tenant hereunder where such failure continues for five (5) days after such amount was due. (b) The abandonment or vacation of the Premises by Tenant. (c) A failure by Tenant to observe and perform any other provision of this Lease to be observed or performed by Tenant, where such failure continues for fifteen (15) days after written notice thereof by Landlord to Tenant; provided, however, that if the nature of the default is such that the same cannot reasonably be cured within the fifteen (15) day period allowed, Tenant shall not be deemed to be in default if Tenant shall, within such period, commence to cure and thereafter diligently prosecute the same to completion. (v) at Landlord's election, such other amounts in addition to or in lieu of the foregoing as may be permitted from time to time by the applicable law in the state in which the demised premises are located. (b) The term “rent” as used herein shall be deemed to be and to mean minimum rental and all other sums required to be paid by Tenant pursuant to the terms of this Lease. (c) As used in subparagraph (a)(i) and (ii) above, the “worth at the time of award” is computed by allowing interest at the rate often percent (10%) per annum. As used in subsection (a)(iii) above, the “worth at the time of award” is computed by discounting such amount at the discount rate of the Federal Reserve Bank located closest to the Premises at the time of award plus one percent (1%). (d) In the event of any such default by Tenant, Landlord shall also have the right, with or without terminating this Lease, to re-enter the Premises and remove all persons and property from the Premises; such property may be removed and stored in a public warehouse or elsewhere at the cost of and for the account of Tenant, or otherwise disposed of by Landlord, all at Tenant's sole cost and expense. (e) In the event of the vacation or abandonment of the Premises by Tenant or in the event that Landlord shall elect to re-enter as provided in subsection (d) above, or shall take possession of the Premises pursuant to legal proceeding or pursuant to any notice provided bylaw, then if Landlord does not elect to terminate this Lease as provided in subsection (a) above, Landlord may from time to time, without terminating this Lease, either recover all rental as it becomes due or relet the Premises or any part thereof for such period and at such rental or rentals and upon such other terms and conditions as Landlord in its sole discretion may deem advisable with the right to make alterations and repairs to the Premises. (f) In the event that Landlord shall elect to so relet, then rentals received by Landlord from such reletting shall be applied first to the payment of any indebtedness other than rent due hereunder from Tenant to Landlord; second, to the payment of any cost of such reletting; third, to the payment of the cost of any alterations and repairs to the Premises; fourth, to the payment of rent due and unpaid hereunder; and the residue, if any, shall be held by Landlord and applied in payment of future rent as the same may become due and payable hereunder. Should that portion of such rentals received from such reletting during any month, which is applied by the payment of rent hereunder, be less than the rent payable during that month by the Tenant hereunder, be less than the rent payable during that month by the Tenant hereunder, then Tenant shall pay such deficiency to Landlord immediately upon demand therefor by Landlord. Such deficiency shall be calculated and paid monthly. Tenant shall also pay to Landlord as soon as ascertained, any costs and expenses incurred by Landlord in such reletting (including, without limitation, any brokerage commissions) or in making such alterations and repairs not covered by the rentals received from such reletting. (g) No re-entry or taking possession of the Premises or any other action under this Section shall be construed as an election to terminate this Lease unless a written notice of such intention be given to Tenant or unless the termination thereof be decreed by a Court of competent jurisdiction. Notwithstanding any reletting without termination by Landlord because of any default by Tenant, Landlord may at any time after such reletting elect to terminate this Lease for any such default. (h) Efforts by Landlord to mitigate the damages caused by Tenant's default in this Lease shall not constitute a waiver of Landlord's right to recover damages hereunder, nor shall the Landlord have any obligation to mitigate damages hereunder.